Private sessions provide one on one instruction with a certified Pilates instructor. They are ideal for beginners and can challenge and refine the intermediate or advanced client. The session may incorporate any or all of the following Pilates apparatus: Cadillac, Reformer, Tower, Wunda Chair, Ladder Barrel, Spine Corrector and others. We recommend our 3-session intro package for clients new to Pilates. Semi-private sessions pair one instructor with up to three clients. Each client will have their own workout and receive individualized feedback and instruction. Semi-privates are ideal for clients familiar with the exercises, equipment and principles of Joseph Pilates. These sessions provide the clients with more independence to further challenge the mind-body connection as they integrate corrections and gain new body awareness. The session may incorporate any or all of the following Pilates apparatus: Cadillac, Reformer, Tower, Wunda Chair, Ladder Barrel, Spine Corrector and others. Reformer Class This workout is for clients of all levels. It will challenge the beginner, intermediate and advanced students with all of our favorite reformer exercises. It is a group class limited to 4 people. For our current Apparatus Class schedule, check our calendar. 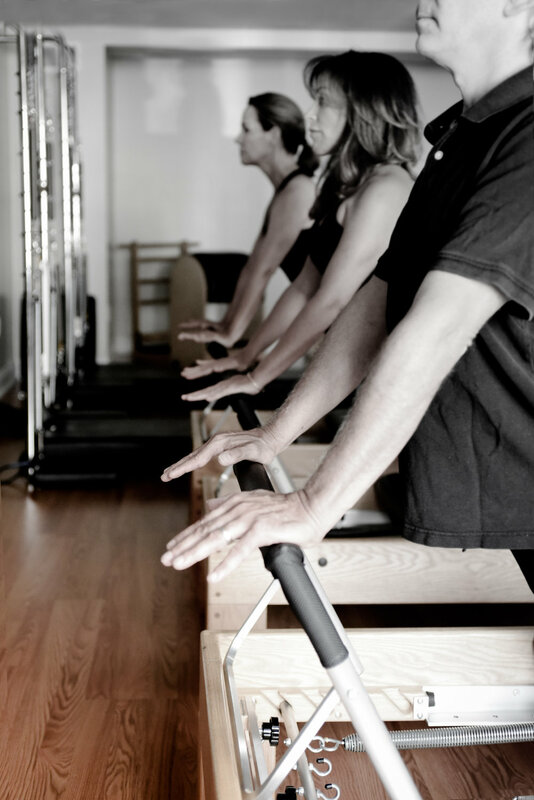 We recommend that clients with no Pilates experience begin with our 3 session intro package before joining this class. Springboard Class This class is for clients of all levels. The boards use spring resistance to lengthen and challenge the muscles for an overall balanced workout. It is a group class limited to 6 people. For our current Apparatus Class schedule, check our calendar. Mat Class A Pilates mat class is designed to use the body's own opposition to correct muscular imbalances caused by everyday life and its repetitive patterns. We can challenge the advanced student and provide the beginner with a solid foundation. Props such as balls, bricks, straps and magic circles may be used in the mat work. For our current Mat Class schedule, check our calendar. Buff Bones® Mat More than just a set of exercises, Buff Bones® is a system of movement for those facing issues of bone and joint health. The bone-strengthening and balance-enhancing workouts are safe, medically endorsed and adaptable to varying levels and different populations. The workouts uniquely help those with bone and joint concerns, including issues like osteoporosis, arthritis and general back and neck pain. But, the workouts can benefit anyone! Those looking to tone up, enhance posture, improve balance, and gain strength in general will also benefit.For our current Buff Bones schedule, check our calendar. Resorative Yoga Restorative yoga uses props, bolsters and blankets to support the body in positions of comfort and ease. Deeply relaxing and calming, this practice helps bring peace and a sense of calm to the body and mind. This meditative healing yoga is open to all levels. Restorative yoga refreshes the body, mind and spirit. For our current Restortive Yoga schedule, check our calendar.